The designer B.J. Talbert supplied designs for several furniture makers, including the firm of Gillow & Co, and his work included this sideboard, made for the International Exhibition held in London in 1871. Gillows displayed the sideboard with vases and dishes on the shelves and it was bought from the Exhibition for this Museum. 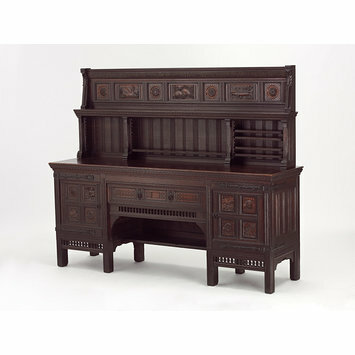 From 1881 the sideboard was part of the collection of British furniture displayed at the Bethnal Green Museum in the East End of London for the benefit of the furniture making workshops that wer concentrated in that area. Talbert did not give his design a name but by 1881 it was known as the 'Pet' sideboard, possibly because of the rabbits carved on the centre of the back. 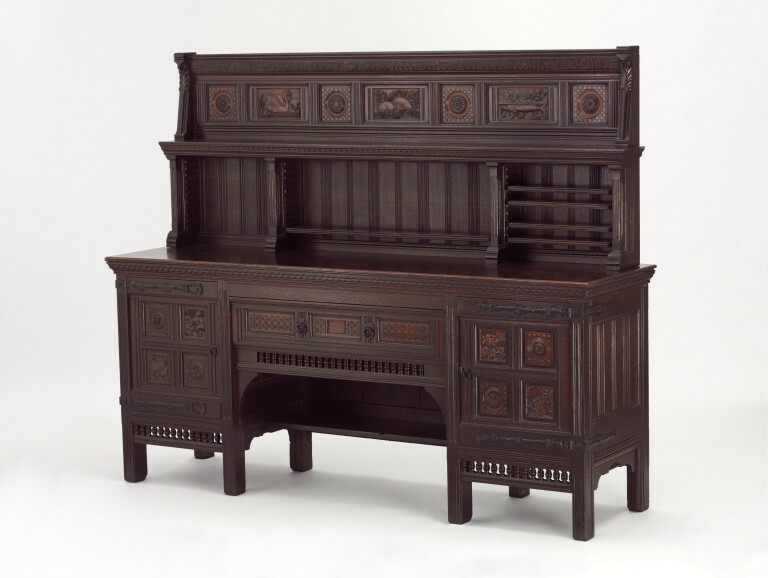 Several other versions of the sideboard were made, both by Gillows and by other firms, showing the popularity of Talbert's design. The sideboard has a superstructure with shelves and a base. The superstructure is inscribed MELIUS EST VOCARI AS CLERA CV CHARITATE QUA AD VITVLV SAGINATV CV ODIO along the top. Below this are seven carved panels, three oblong in shape, the central one of two rabbits with on the left one of a swan and on the right one of a pike. These three panels are separated by four square carved panels of roundels on a checkered ground. Below is one long fixed shelf and five shorter adjustable shelves, separated by brackets, against a panelled back. The base has a flat top and under this a central drawer with two loop handles and three carved geometric panels above a frieze of stumpy columns and a arched niche with a shelf. On either side of the drawer is a cupboard with doors carved with geometric and naturalistic designs, fitted with circular handles and strap hinges. Below each cupboard is a frieze of stumpy columns set between each pair of front square section legs. There are also two pairs of back square section legs. Better is a dinner of herbs where love is, than a stalled ox and hatred therewith, Proverbs XV xvii. The cabinet, lent by Gillows, was on display in Room IX of the West Gallery of the International Exhibition held in London in 1871. It is illustrated there in Scheme of Annual International Exhibitions of Selected Works of Fine Art (including Music) Industrial Art and Recent Scientific Inventions and Discoveries To be Held under the Direction of Her Majesty's Commissioners for the Exhibition of 1851 London n.d, Photograph VI. Ceramics were displayed on the shelves and a large vase was placed in front of the cabinet which stood on a plinth against a panelled wall with a curved top, also by Gillows. London International Exhibition, 1871 Official Reports of the Various Sections of the Exhibition edited by the Right Hon. Lord Houghton, Fine Arts Division Part IV, p. 40. Acquired from the 1871 Exhibition by the Commissioners of the 1851 Exhibition, the sideboard was lent by them to the South Kensington Museum from lst January 1872. By 1881 it was on display at Bethnal Green Museum 'for the benefit of East End cabinet makers' The Cabinet Maker, 1st October 1881, p. 67. After display in the V&A's exhibition of Victorian and Edwardian Decorative Arts, 1952-3, the Museum asked the Commissioners to convert the loan into a gift. Several other examples of Talbert's 'Pet' sideboard were made by Gillows and by other firms. Gillows' Estimate Sketch Books for 1870-1874 (City of Westminster Archives Centre, No. 344/110-111) show that they were making versions of the sideboard, with different combinations of inscriptions, monograms, leather panels and carving, in March 1871. In the National Gallery of Victoria, Melbourne, Australia there is an example of the sideboard stamped 'Gillow & Co.', accession no. D109-1976. This version has the same inscription as the Museum's sideboard but five carved panels of different design. The central and outer panels are of a sheaf of wheat within a lozenge surrounded by scrolling decoration. In between are two panel, the left hand one with a male head with a cap and the right hand one shows a female head with floral bandeau and hair plaited at the base of the neck. Another exzample, with the inscription and the same panels as the Museum's sideboard, and stamped 'Jas. Shoolbred & Co.' on the frieze drawer, was sold Sothebys London, 13th June 2001, lot 134.
oak with boxwood panels and metal hinges; designed by B.J. Talbert and made by Gillow & Co for the London International Exhibition, 1871.